Occasionally, I run across a Victorian trade card or postcard that triggers a memory. The trade card to the right did just that. I’d remembered sitting in front of my parent’s black and white Zenith TV (yup, black & white), watching harness racing. I was into watching sports on Wide World of Sports on weekend afternoons at the time. Per Wikipedia, harness racing is a form of horse-racing in which standard bred horses race in a specified gait. They usually pull two-wheeled carts called sulkies. There are two gaits in harness racing, trotting and pacing. A pacer moves its legs laterally; a trotter moves its legs forward in diagonal pairs. (The horses move so fast, I wonder how anyone can tell which is which.) 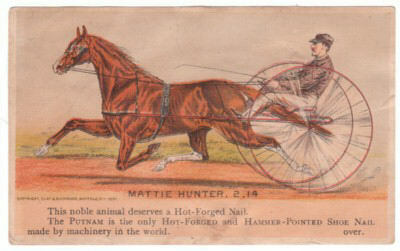 Mattie Hunter raced using a pacing gait. OK, enough technical stuff. Why Was Mattie Hunter Important? In 1877, pacing was struggling as it played second fiddle to trotting in harness racing. Governor John Todd decided to enter his talented pacer, Sweetser, in an open pacing race of the Cleveland Grand Circuit. Sweetser won, resulting in a boost for the pacing gait in harness racing. Four pacers in particular were responsible for bringing pacing further into the limelight. Their performances sparked interest in a gait twenty years before the phenomena of Dan Patch. They were Sleepy Tom, Mattie Hunter, Rowdy Boy, and Lucie known as “The Big Four”. ** If you liked this Victorian trade card blog post, please click on the bookmark link to the lower right.